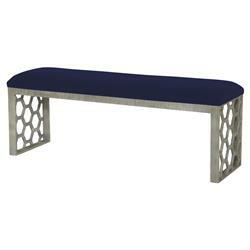 Bring character, comfort and luxury to your home with this modern classic bench. Reminiscent of graphic mid-century modern designs, the antique silver metal frame features tessellated hexagon cutouts. A bright, lapis blue velvet cushion provides a plush seat and a lively pop of color. Positioned in your foyer or at the center of your living room, this stylish bench is sure to become one of the most sought after seats in your home.